Santa Monica has always been a favourite spot of ours. Years ago, we spent a week there while backpacking around the States, doing all that backpackers do.....shopping, bar-hopping, and staying in hostels. Now that we were a family of four, we had to look at Santa Monica in a whole different way, the days of finding the next happy hour, and sleeping in shared dorms are over. Luckily Santa Monica is a haven of recreation and entertainment for all ages! 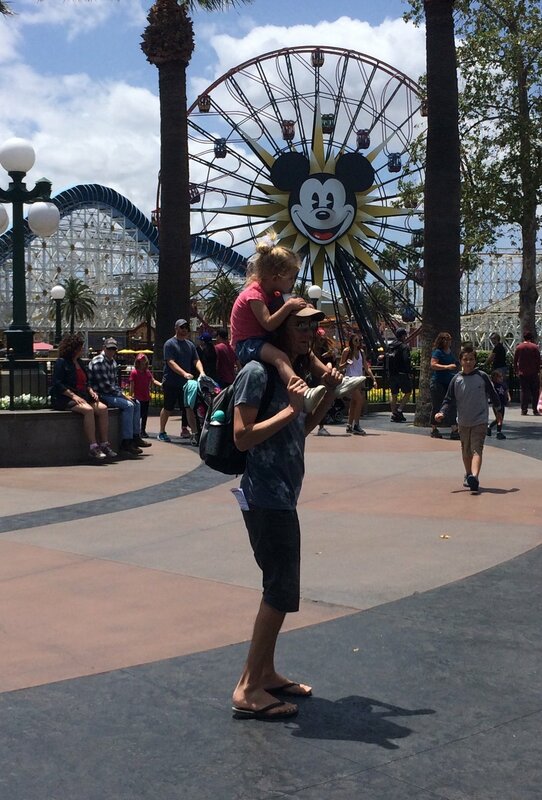 Santa Monica was our last stop on our 'Theme Park' adventure with the kids. We wanted a couple of days in an truly LA suburb to round off our trip. 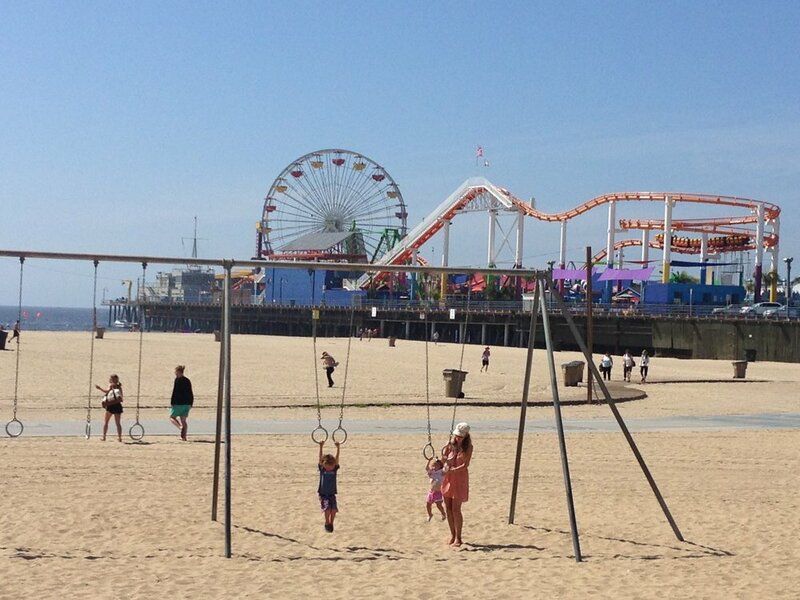 With the beach, bike path, and Santa Monica Pier Amusement Park, we couldn't go think of a better place to be. As we now required more than a couple of bunk beds, we chose to stay at DoubleTree Suites by Hilton Santa Monica. This hotel is one of few in Santa Monica that offers suites, meaning that we had a separate living room with sofa bed, and a King sized bedroom. The kids loved the view down to the hotel swimming pool, and loved swimming in it even more! The room was spacious and well-equipped with a mini-fridge, handy to store the kids snacks. After checking in, we ventured out to explore the area. The hotel is an easy three block walk down to the beach and pier. We wanted to make our way, all the way down the beach boardwalk to Venice, so we decided the best way for us to do that was to hire bikes. We had the our trusty Bugaboo Stroller with us, but the bike rental shop was nice enough to store it there until we returned. We hired two bikes, one with a double seated cart attached to the front, strapped the kids in and headed off. This boardwalk has some of the best eclectic people watching in LA. From buskers to an impromptu 'Roller Disco', to men and women working out at Muscle Beach, inspired by Arnold Schwarzenegger! The kids and adults were all kept well entertained! There are also a couple of great playgrounds along the way. Satisfied with our afternoon out, we headed back to the hotel for a swim, then out to dinner along the Santa Monica Pier. While waiting for our table at Bubba Gumps we had noticed a very popular looking little burger shack, Pier Burger, so snuck in a cheeky snack to keep the kids tummies content. (And perhaps mine!) It was sooo good! The next morning we decided to have breakfast on Third Street Promenade. If a walk along the beach to Venice is too far, or you don't fancy hiring bikes, then you can still catch great street-performers and plenty of musical entertainment along Third Street Promenade, from sun up till sun down. Best of all it is free and keeps the kids entertained. Another bit of excitement for the kids are the dinosaur statues in the centre of the promenade. Roaring with the dinosaurs on Third Street Promenade! As this was a 'Theme Park' vacation after all, we couldn't leave Santa Monica without hitting some rides at Santa Monica Pier Amusement Park. You can purchase rides as you go, which is great, it means you can simply just walk around the fair ground, or if it's your last day, like it was ours, you don't have to blow your budget! Surprisingly Bodie wasn't quite tall enough for some of the rides, that he certainly was tall enough for at Disneyland, but this didn't matter, as there is a great area and assortment of rides for the smaller kids, and he had just as much fun on these. The highlight for the kids though, was winning a giant Nemo stuffed toy, which the friendly 'carnie' attendant may or may not have rigged for him!! Hands in the air! The children's rides at Santa Monica Pier Amusement Park. As we had a late night flight from LAX, we headed back to the DoubleTree Suites by Hilton and had a final swim and relaxing soak in the jacuzzi. Although we had already checked out, the Hotel held our bags for us, which we could easily get access to throughout the day. The pool area, has excellent changing rooms, with showers and plenty of space to change and freshen up for our flight. 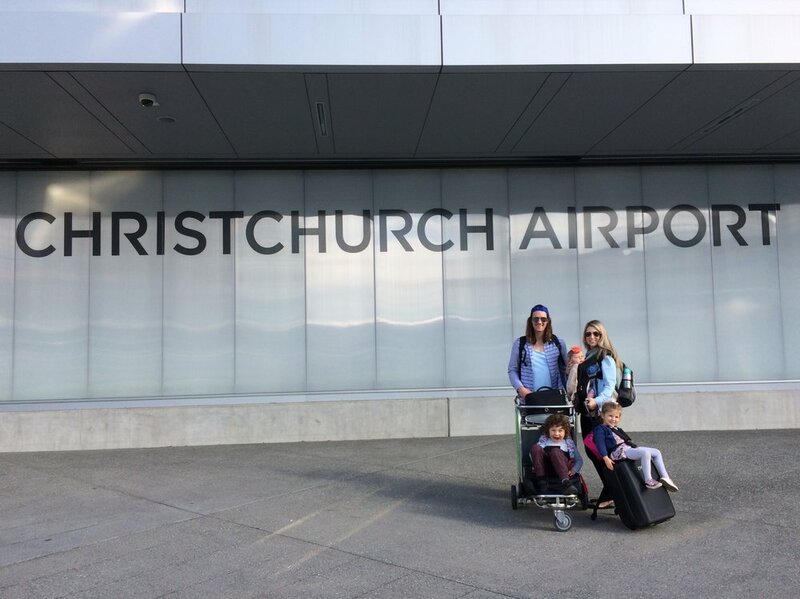 The use of the pool after checking out was a great bonus, as it tired the kids out enough, that with with help of the Air New Zealand Sky Couch, they slept soundly for 10 hours of the flight home!! So although it was a different kind of vacation in Santa Monica this time, it can be equally exciting with kids, if not more, as you get to experience it in a new light, and through their eyes!